Each Square on the Chart represents two linen threads. Use one strand of silk throughout. Stitch a front and a back. 2. Cut 2 pieces of posterboard and 2 pieces of Warm & Natural Quilt Batting to fit inside the Stem Stitch border area. 3. 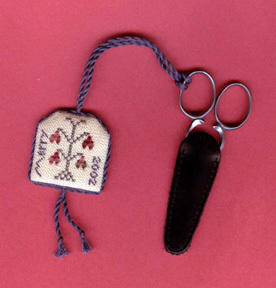 After trimming seam allowances to one half" beyond the Stem Stitch border, place batting next to needlework (wrong side) and then posterboard on Stem Stitch border. Baste seam allowances in place. Repeat for back. 4. Blind stitch front to back, wrong sides together. 5. 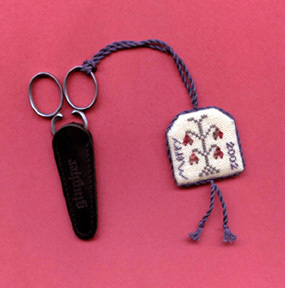 Make cording with Midnight and tack to fob along edges, leaving loop at the top for attaching to scissors handle and tails at the bottom.